Join CrimsonLogic, and be ready to embark on an adventure around the world. This is the slick new advertising message that technology industry veteran Saw Ken Wye wants to pitch to young software professionals and engineers to get them to come on board. Just how exotic are the locales that young professionals could be dispatched to if they are hired? "I have staff who can give you the exact locations of countries you've never heard of before, like Suriname," said Mr Saw, 55, the firm's newly appointed chief executive. "We want to take bright young people and give them an adventurous life, letting them contribute by helping government organisations elsewhere to deploy IT systems." CrimsonLogic, an e-government services provider has a global footprint, mostly in developing countries. It has developed 19 trade-related applications in 16 countries, such as China, Ghana and Panama. It also provides other e-government services for legal, health-care and national-identity issues. Mr Saw feels he is completing the unfinished business he started when he was with the National Computer Board (NCB) between 1983 and 1997. 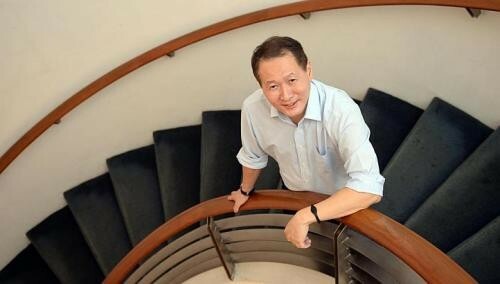 As industry development director, he was helping local infocomm technology companies such as CSA, Far East Computer, IPC and IES to go global. He did not quite succeed and over time, some were sold while others have left the IT business altogether. "CrimsonLogic is still going strong at 25 years old. We're an an unknown entity here but we're better known overseas. We have more business inquiries from overseas without doing a lot of marketing," he told The Straits Times last week. CrimsonLogic started in 1988 as Singapore Network Systems. It developed and implemented TradeNet in 1989, one of the first systems in the world that allowed the trading community to submit permit applications electronically for approval. Since then, the firm has developed other public sector projects, including the electronic filing system for the Singapore courts, SingPass and OneInbox, the Government's e-mail system. CrimsonLogic is majority- owned by IE Singapore, which has a 55 per cent share. The rest of the firm is split among SingTel and public sector agencies like the Civil Aviation Authority of Singapore. Scandal hit the company in 2005, when its then chief executive Velusamy Mathivanan and three other senior executives were charged with corruption. They were accused of bribing an officer at another firm to secure an IT project. They were acquitted in December 2006. But CrimsonLogic survived the scandal and is thriving today. This year, its revenue will grow 40 per cent due to overseas projects, said Mr Saw, who was born in Kuala Lumpur and will soon become a Singaporean. He wants to more than double revenue from the expected $100 million this year to about $250 million within three years. "We need to grow faster but not at the expense of productivity. We have about 1,000 people now. So each employee is contributing about $100,000, which is not great. We need to raise this a bit more." He is likely to add 500 staff to the firm's 1,000-strong headcount. Developing countries will continue to be the company's focus. "We've been able to crack overseas markets because we're a trusted partner. Having a government pedigree is good for us because other public-sector authorities know that we have integrity and compliance models." Before joining CrimsonLogic about two months ago, Mr Saw was with software giant Microsoft for nearly 17 years, holding different positions. Having spent so many years with Microsoft, his learning curve at CrimsonLogic has not been so steep. Meetings with the management team have already been reduced from weekly to fortnightly, and he now intends to make them a monthly occurrence. "We did so many activities at Microsoft and we had staff who travelled. We learnt to use technology like video conferencing, shared notes and the like to communicate. I'm introducing such technologies here." Ms Natasha Kwan, a colleague of 15 years from his Microsoft days, said: "Ken is a passionate problem-solver. He will bring insightful perspectives to challenge his team to achieve what he sets out to do. "He is a good mix of a visionary and a coaching leader who rallies his team to give their best," said Ms Kwan, now the South Asia managing director for IT solutions provider T-Systems. For Mr Saw, leaving friends he had made in his many years at Microsoft was painful but he has big ambitions for his new career. His personal aim is to make CrimsonLogic a world-class company, with a brand that people recognise. Ultimately, he wants to be able to compete with other global companies like IBM and Accenture. "I'm a sucker for causes. What appealed to me is the pioneering spirit of NCB in industry development. I feel this here. I hope to make a difference in CrimsonLogic.